Jenetics is an advanced Genetic Algorithm, Evolutionary Algorithm and Genetic Programming library, written in modern day Java. Jenetics is designed with a clear separation of the several concepts of the algorithm, e.g. Gene, Chromosome, Genotype, Phenotype, Population and fitness Function. Jenetics allows you to minimize and maximize the given fitness function without tweaking it. In contrast to other GA implementations, the library uses the concept of an evolution stream (EvolutionStream) for executing the evolution steps. Since the EvolutionStream implements the Java Stream interface, it works smoothly with the rest of the Java Stream API. The jenetics.ext module contains classes for solving Multi-objective problems with Jenetics. The jenetics.prog module allows to do Genetic programming with Jenetics. No need to tweak the fitness function for minimization problems. Just change the configuration of the evolution Engine. Easy changeable PRNG (RandomRegistry). No special PRNG interface; the standard Java Random engine allows the use of existing random generators. Processing of the evolutionary steps can be executed in parallel! No runtime dependencies to Third Party libraries! No mismatch and class loading problems with other libraries. Complete Documentation and User guide available. An excellent introduction is given by Baeldung in this blog entry. There is also an introductory article series (part 1, part 2) about Jenetics in the (German) JavaSpektrum magazine, issue 01 and 03/2018. The minimum evolution Engine setup needs a genotype factory, Factory<Genotype<?>>, and a fitness Function. The Genotype implements the Factory interface and can therefore be used as prototype for creating the initial Population and for creating new random Genotypes. // 2.) Definition of the fitness function. // 3.) Create the execution environment. The probably most challenging part, when setting up a new evolution Engine, is to transform the problem domain into a appropriate Genotype (factory) representation. In our example we want to count the number of ones of a BitChromosome. Since we are counting only the ones of one chromosome, we are adding only one BitChromosome to our Genotype. In general, the Genotype can be created with 1 to n chromosomes. Once this is done, the fitness function which should be maximized, can be defined. Utilizing the new language features introduced in Java 8, we simply write a private static method, which takes the genotype we defined and calculate it's fitness value. If we want to use the optimized bit-counting method, bitCount(), we have to cast the Chromosome<BitGene> class to the actual used BitChromosome class. Since we know for sure that we created the Genotype with a BitChromosome, this can be done safely. A reference to the eval method is then used as fitness function and passed to the Engine.build method. In the third step we are creating the evolution Engine, which is responsible for changing, respectively evolving, a given population. The Engine is highly configurable and takes parameters for controlling the evolutionary and the computational environment. For changing the evolutionary behavior, you can set different alterers and selectors. By changing the used Executor service, you control the number of threads, the Engine is allowed to use. An new Engine instance can only be created via its builder, which is created by calling the Engine.builder method. In the last step, we can create a new EvolutionStream from our Engine. The EvolutionStream is the model or view of the evolutionary process. It serves as a »process handle« and also allows you, among other things, to control the termination of the evolution. In our example, we simply truncate the stream after 100 generations. If you don't limit the stream, the EvolutionStream will not terminate and run forever. Since the EvolutionStream extends the java.util.stream.Stream interface, it integrates smoothly with the rest of the Java Stream API. The final result, the best Genotype in our example, is then collected with one of the predefined collectors of the EvolutionResult class. 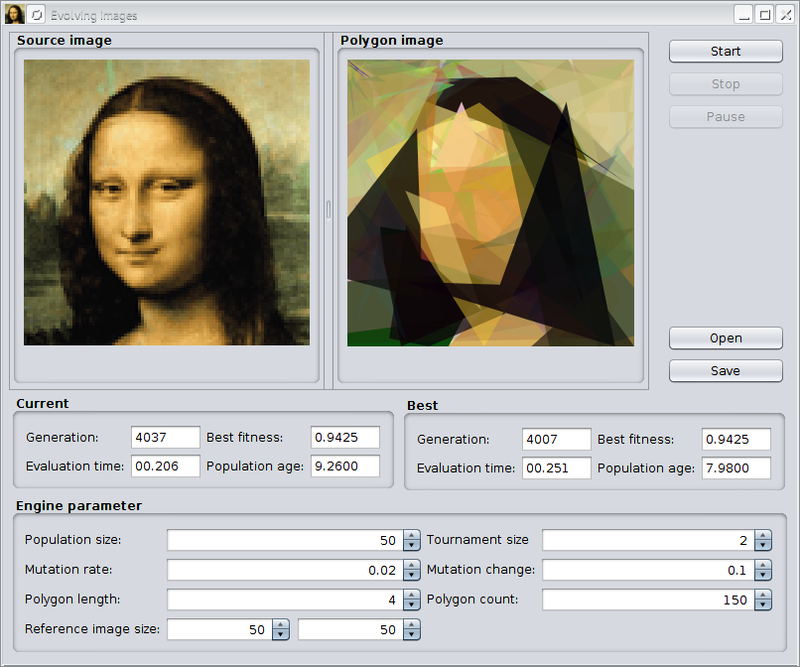 This example tries to approximate a given image by semitransparent polygons. It comes with an Swing UI, where you can immediately start your own experiments. For a detailed description on how to execute this example, have a look at the Github project page. Symbolic regression is a classical example in genetic programming and tries to find a mathematical expression for a given set of values. The example shows how to solve the GP problem with Jenetics. We are trying to find the polynomial, 4x3 - 3x2 + x, which fits a given data set. The sample data where created with the polynomial we are searching for. This makes it easy to check the quality of the approximation found by the GP. io.jenetics.ext (javadoc): Additional, non-standard, genetic operators and chromosomes. Containing classes for the Weasel program and tree data structures. io.jenetics.prog (javadoc):The modules contains classes which allows to do genetic programming (GP). It seamlessly works with the existing EvolutionStream and evolution Engine. io.jenetics.xml (javadoc): XML marshalling module for the Jenetics base data structures. This libraries doesn't have any dependency to Jenetics and can be used as they are. io.jenetics.prngine: A pseudo-random number generator library for sequential and parallel Monte Carlo simulations. It has been designed to work smoothly with the Jenetics library, but it has no dependency to it. All PRNG implementations of this library extends the Java Random class, which makes it easily usable in other projects. io.jenetics.jpx: A Java library for creating, reading and writing GPS data in GPX format. It is a full implementation of version 1.1 of the GPX format. The data classes are completely immutable and allows a functional programming style. They are working also nicely with the Java 8 Stream API. Since it is also possible to calculate the distance between way-points, it is a good fit for the TSP. Jenetics.NET: Experimental .NET Core port in C# of the base library. Chartsy|One: Chartsy|One is a Netbeans based tool for stock market investors and traders. Chronetic: Chronetic is an open-source time pattern analysis library built to describe time-series data. APP4MC: Eclipse APP4MC is a platform for engineering embedded multi- and many-core software systems. Al Akkad, M. A., & Gazimzyanov, F. F. AUTOMATED SYSTEM FOR EVALUATING 2D-IMAGE COMPOSITIONAL CHARACTERISTICS: CONFIGURING THE MATHEMATICAL MODEL. Intellekt. Sist. Proizv., 17(1), 26-33. doi: 10.22213/2410-9304-2019-1-26-33. Apr. 2019. Alcayde, A.; Baños, R.; Arrabal-Campos, F.M. ; Montoya, F.G. Optimization of the Contracted Electric Power by Means of Genetic Algorithms. Energies, Volume 12, Issue 7, Apr. 2019. Aleksandar Prokopec, Andrea Rosà, David Leopoldseder, Gilles Duboscq, Petr Tůma, Martin Studener, Lubomír Bulej, Yudi Zheng, Alex Villazón, Doug Simon, Thomas Wuerthinger, Walter Binder. On Evaluating the Renaissance Benchmarking Suite: Variety, Performance, and Complexity. Cornell University: Programming Languages, Mar. 2019. S. Appel, W. Geithner, S. Reimann, M Sapinski, R. Singh, D. M. Vilsmeier OPTIMIZATION OF HEAVY-ION SYNCHROTRONS USINGNATURE-INSPIRED ALGORITHMS AND MACHINE LEARNING.13th Int. Computational Accelerator Physics Conf., Feb. 2019. Saad, Christian, Bernhard Bauer, Ulrich R Mansmann, and Jian Li. AutoAnalyze in Systems Biology. Bioinformatics and Biology Insights, Jan. 2019. Gandeva Bayu Satrya, Soo Young Shin. Evolutionary Computing Approach to Optimize Superframe Scheduling on Industrial Wireless Sensor Networks. Cornell University, Dec. 2018. H.R. Maier, S. Razavi, Z. Kapelan, L.S. Matott, J. Kasprzyk, B.A. Tolson. Introductory overview: Optimization using evolutionary algorithms and other metaheuristics. Environmental Modelling & Software, Dec. 2018. Erich C. Teppan and Giacomo Da Col. Automatic Generation of Dispatching Rules for Large Job Shops by Means of Genetic Algorithms. CIMA 2018, International Workshop on Combinations of Intelligent Methods and Applications, Nov. 2018. Pasquale Salzaa, Filomena Ferrucci. Speed up genetic algorithms in the cloud using software containers. Future Generation Computer Systems, Oct. 2018. Ghulam Mubashar Hassan and Mark Reynolds. Genetic Algorithms for Scheduling and Optimization of Ore Train Networks. GCAI-2018. 4th Global Conference on Artificial Intelligence, Sep. 2018. Drezewski, Rafal & Kruk, Sylwia & Makowka, Maciej. The Evolutionary Optimization of a Company’s Return on Equity Factor: Towards the Agent-Based Bio-Inspired System Supporting Corporate Finance Decisions. IEEE Access. 6. 10.1109/ACCESS.2018.2870201, Sep. 2018. Arifin, H. H., Chimplee, N. , Kit Robert Ong, H. , Daengdej, J. and Sortrakul, T. Automated Component‐Selection of Design Synthesis for Physical Architecture with Model‐Based Systems Engineering using Evolutionary Trade‐off. INCOSE International Symposium, 28: 1296-1310, Aug. 2018. Stephan Pirnbaum. Die Evolution im Algorithmus - Teil 2: Multikriterielle Optimierung und Architekturerkennung. JavaSPEKTRUM 03/2018, pp 66–69, May 2018. W. Geithner, Z. Andelkovic, S. Appel, O. Geithner, F. Herfurth, S. Reimann, G. Vorobjev, F. Wilhelmstötter. Genetic Algorithms for Machine Optimization in the Fair Control System Environment.The 9th International Particle Accelerator Conference (IPAC'18), May 2018. Stephan Pirnbaum. Die Evolution im Algorithmus - Teil 1: Grundlagen. JavaSPEKTRUM 01/2018, pp 64–68, Jan. 2018. Alexander Felfernig, Rouven Walter, José A. Galindo, David Benavides, Seda Polat Erdeniz, Müslüm Atas, Stefan Reiterer. Anytime diagnosis for reconfiguration. Journal of Intelligent Information Systems, pp 1–22, Jan. 2018. Bruce A. Johnson. From Raw Data to Protein Backbone Chemical Shifts Using NMRFx Processing and NMRViewJ Analysis. Protein NMR: Methods and Protocols, pp. 257--310, Springer New York, Nov. 2017. Cuadra P., Krawczyk L., Höttger R., Heisig P., Wolff C. Automated Scheduling for Tightly-Coupled Embedded Multi-core Systems Using Hybrid Genetic Algorithms. Information and Software Technologies: 23rd International Conference, ICIST 2017, Druskininkai, Lithuania. Communications in Computer and Information Science, vol 756. Springer, Cham, Sep. 2017. Michael Trotter, Guyue Liu, Timothy Wood. Into the Storm: Descrying Optimal Configurations Using Genetic Algorithms and Bayesian Optimization. Foundations and Applications of Self* Systems (FAS*W), 2017 IEEE 2nd International Workshops Sep. 2017. Emna Hachicha, Karn Yongsiriwit, Mohamed Sellami. Genetic-Based Configurable Cloud Resource Allocation in QoS-Aware Business Process Development. Information and Software Technologies: 23rd International Conference, ICIST 2017, Druskininkai, Lithuania. Web Services (ICWS), 2017 IEEE International Conference, Jun. 2017. Abraão G. Nazário, Fábio R. A. Silva, Raimundo Teive, Leonardo Villa, Antônio Flávio, João Zico, Eire Fragoso, Ederson F. Souza. Automação Domótica Simulada Utilizando Algoritmo Genético Especializado na Redução do Consumo de Energia. Computer on the Beach 2017 pp. 180-189, March 2017. Bandaru, S. and Deb, K. Metaheuristic Techniques. Decision Sciences. CRC Press, pp. 693-750, Nov. 2016. Lyazid Toumi, Abdelouahab Moussaoui, and Ahmet Ugur. EMeD-Part: An Efficient Methodology for Horizontal Partitioning in Data Warehouses. Proceedings of the International Conference on Intelligent Information Processing, Security and Advanced Communication. Djallel Eddine Boubiche, Faouzi Hidoussi, and Homero Toral Cruz (Eds.). ACM, New York, NY, USA, Article 43, 7 pages, 2015. Andreas Holzinger (Editor), Igo Jurisica (Editor). Interactive Knowledge Discovery and Data Mining in Biomedical Informatics. Lecture Notes in Computer Science, Vol. 8401. Springer, 2014. Lyazid Toumi, Abdelouahab Moussaoui, Ahmet Ugur. Particle swarm optimization for bitmap join indexes selection problem in data warehouses. The Journal of Supercomputing, Volume 68, Issue 2, pp 672-708, May 2014. TANG Yi (Guangzhou Power Supply Bureau Limited, Guangzhou 511400, China) Study on Object-Oriented Reactive Compensation Allocation Optimization Algorithm for Distribution Networks, Oct. 2012. John M. Linebarger, Richard J. Detry, Robert J. Glass, Walter E. Beyeler, Arlo L. Ames, Patrick D. Finley, S. Louise Maffitt. Complex Adaptive Systems of Systems Engineering Environment Version 1.0. SAND REPORT, Feb. 2012.